The ballot for industrial action among the nearly 4 million members of the Local Government Pension Scheme began on 20 February. The first provisional national stoppage is scheduled for 28 March. At this late stage the trade unions are still divided over strategy and tactics. The mindless baying for indefinite strike action is accompanied by the mind-dead who are incapable of looking to the strengths or inventiveness of the members. These ideas reflect a failure to keep pace with the composition and changes within the pension scheme. Two-thirds of scheme members are women, half of scheme members are part-time. Some of the top occupations within the scheme are classroom assistants, care assistants, home carers, catering staff and nursery nurses. Therefore any industrial action will place the most vulnerable, such as children, the elderly and those with learning disabilities, at greatest risk. A callous government and callous employers care nothing for these staff or those they serve. Local authority services have been decimated through privatisation, out-sourcing, contracting-out and competitive tendering over the last 25 years. Unfortunately the thinking of too many local government trade union activists is locked into the 1970s. Calls to pull out critical core groups of workers, be they computer staff or traffic wardens, come up against the brutal reality that many of these workers are no longer employed directly by local government or remain in the pension scheme. The employers and government learnt a long time ago what their vulnerabilities were and have systematically moved the goal posts. Privatisation may have been fronted as a finance market-driven strategy, but it was and is about destroying the ability of workers to get organised. An industrial action strategy which only argues for parity with an already flawed deal (teachers, civil servants, health workers) and does not tackle either the European directives that are the key reason for the attack on pensions has arisen and or our right to decide how our deferred wages are to be utilised – our sovereignty – is speeding into a cul de sac. 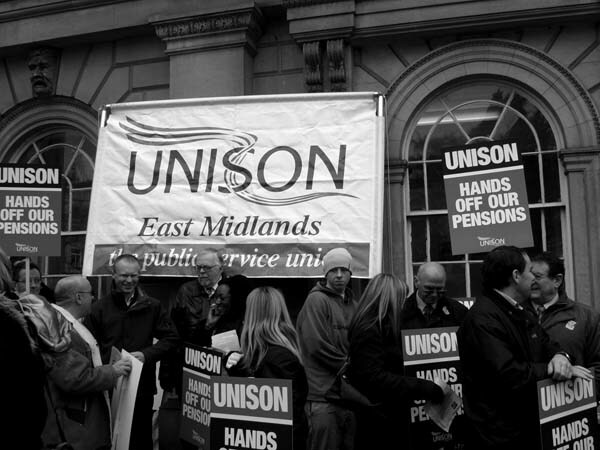 18 February 2005, Northampton: local government workers march over pensions. Any deal based on the health model is built on sand. The employers' organisations in health, the NHS Pensions Actuaries (soon to be privatised!) and the Treasury mandarins are already loudly stating that the 'deal' for health workers is unsustainable. So what is being advocated as a solution for LGP Scheme members – parity with Health – may be a solution which collapses in the very near future. Also, such a two- or three-tier pension scheme, still institutionalising a detriment for new and young workers, is fraught with problems. This is because research by economic and financial institutions is clearly indicating that what the government will gain by forcing through longer working and reduced benefits for some will be off-set by loss of taxes and income and additional expenditure in higher benefits for others. Any savings the government makes will be marginal – an estimated £3 billion out of a scheme valued at £89 billion, although all such evaluation of savings is highly questionable in the first place. The trade unions reluctantly find themselves in a dispute which they did not seek and probably never contemplated ever occurring. The error arose from a mistaken view that pensions were somehow sacrosanct and untouchable. Some are saying that the scale of possible industrial action over pensions is on par with the General Strike in 1926. However, parallels could also be drawn with a whole host of 1920s disputes which shattered wages and trade union organisation. The General Strike was a defeat which took the British labour movement nearly 50 years to recover from. This is not a comparator we want. The last thing we should be drawn into is a set piece battle on the government and employers' terms – which is exactly what is looming.